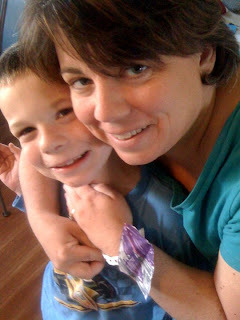 Acting Balanced: AAM Guest Post: The word "autism"
AAM Guest Post: The word "autism"
And the truth is that my youngest son, Robbie, does not have autism. But he is on the autism spectrum. Technically, he has Pervasive Development Disorder–Not Otherwise Specified (PDD-NOS). When he was diagnosed with that four years ago (at age 4), PDD-NOS was described to us as a condition in which a child has some of the characteristics of autism and some of the characteristics of Asperger’s Syndrome, but not enough of either to qualify for one of those diagnoses. He does not have trouble making eye contact or registering the emotions of people around him. He is communicative, though his vocabulary and word comprehension is a little behind some of his classmates. He does obsess over things (currently, it’s Box Tops). He has difficulty with transition and tends to overreact to situations, crying easily. Do you watch “The Middle” on ABC? Robbie is our Brick, though not quite as bookish. Probably one of the hardest things for us as parents to figure out is, behaviorally, what is attributable to his place on “the spectrum,” what is habit, and what is the result of being the spoiled baby of the family? In the beginning of our journey, we were referred to an occupational therapist who told us that Robbie lives with Sensory Processing Disorder (SPD), that he’s a sensory seeker (as if we couldn’t tell that by all the jumping and crashing and big, tight hugs). Sensory Processing Disorder. That sounded good to me. At least it wasn’t the dreaded “A” word. So, when he started kindergarten, I told the teachers about his SPD. I referred them to the book The Out of Sync Child. We worked with the resource center at the school to infuse his day with a sensory diet. We were grateful for the patience and extra care with which both his first and second kindergarten teachers treated him. We like to say that kindergarten was so fun, he decided to do it twice. We also say that we try to limit his public appearances and we hope he can move out of our house someday. For us, humor helps. The word and its connection to my child took my breath away. I was quick to correct her – PPD-NOS, SPD. I wanted her to know that MY child does NOT have autism. I was offended by her use of the word. But now, several months later, I can step back and see that it really doesn’t matter what invisible label Robbie wears. He is who he is. He is creative and affectionate. He is silly and artistic. He is frustrating and a joy. And yes, he is on the autism spectrum. We will continue to advocate for his needs and set expectations that challenge him to grow. I have hopes that he will make his mark on this world (probably with Legos) and I have no doubt that he will do it in his own way (though hopefully after he can move out of our house). Amy is a wife and working mother (Aren't we all?) of 3. I've been married for almost 17 years and have seen the inside and out of "for better or for worse." But we're still at it.She was born and raised in the Midwest and is raising her family in the great state of Indiana, where we have considerably more than corn, soybeans and race cars. Amy blogs at The 4th Frog Blog, stop by and see why!